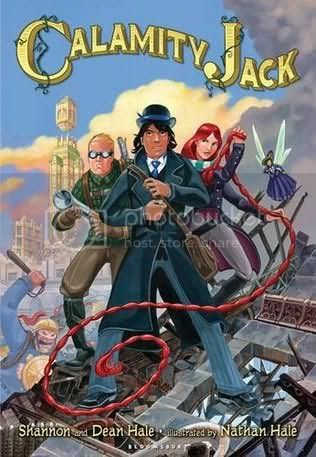 This creative re-imagining of the classic Jack in the Beanstalk tale is set in a steampunk Old West. Calamity Jack is a sequel to Rapunzel's Revenge, but stands perfectly well on its own. Jack is a ne'er do well lad who's always got a scheme or swindle planned. But his heart is in the right place, as he's only trying to make life easier for his momma, a hard-working baker. His best friend, a pixie named Pru, is a frequent accomplice to his hi-jinks. After landing in some hot water after a particularly dangerous heist involving a giant beanstalk, he decides to lie low and leaves his hometown of Shyport. He soon meets Rapunzel, a lasso-twirling red-headed spitfire, and after some adventures, the two of them decide to return to Shyport. Blunderboar, a cruel giant despot, is practically running the city, and Jack and his friends must act quickly to protect Jack's mother from the ant-people attacks that Blunderboar is orchestrating. My favorite page of the book is the scene where Blunderboar's organic defense shield, consisting of shrieking male brownies, is deactivated by Pru and her friends. In the first panel, we see the lady pixies determinedly soar upwards in their hats, petticoats and Victorian finery. They face-off with the brownies, whose yells are cut short when the pixies pour on the charm, dimpling at them and offering a chorus of, "Hello, live around here?" quickly reducing the brownies to a group of hat-doffing bashful gents. The Hales have woven a fantastic, yet believable world where Native Americans, diminutive pixies, giants, pig-like people, invading alien insects and cowboys all co-mingle amidst locomotives, saloons, hi-tech dirigibles, floating palaces, crumbling buildings and run-down theatre districts alike. The colorful twang of the Old West vocabulary and the sure, action-packed, detail-laden full-color art pair very nicely. I would recommend this to graphic novel fans, especially those who liked (or didn't like) Patricia Wrede's alternate magical history Frontier Magic series.